Kevin Werbach has an article on slate.com prophesizing that spam is juat about to kill e-mail as we know it. And I agree. E-mail stopped being useful to me already a couple of years ago, because the ratio of stuff I want to stuff I don't want had become just unacceptable. And now it is much worse. I get much more spam than mail from real people, and I do get a lot of real mail. The only viable answer is going to be that people will accept mail only from people they specifically have allowed to send them mail. You will have a 'whitelist' in the form of, for example, your address book. There might be some mechanism for strangers to validate that indeed they are real people, but gone are the days where you can just get directly through to a stranger. Next I think we'll probably need that for phones too. I also get more phone calls from pushy telemarketers than from real people. 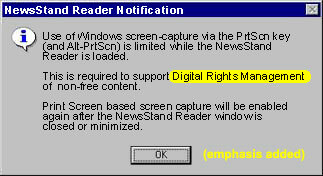 DRM - Digital Rights Management - is a euphemism for media companies trying to control your behavior in order to maximize their own profits. It is in brief that big companies will be enabled to control when and how you look at THEIR stuff, and that they'll be able to tamper with your computer, or your car stereo, or your VCR, if there is any indication that you want to play their content in a different setting than they had in mind. It is a BAD thing. See an intro here from the Electronic Privacy Information Center. Microsoft and the big record companies and movie studios love DRM. They've bribed some U.S. congress people to back them. They all think it is the solution to piracy and a rapidly changing marketplace. They can turn the clock back to the way it was, or rather, the way it always should have been, in their view. The hidden agenda seems to be to manipulate you into a position where you pay something whenever you read or view or listen to their copyrighted materials, and to pressure the hardware manufacturers and operating system manufacturers to make your hardware and software do their bidding. Apple is taking a stance against it, so buy a Mac. And read Chris Locke's righteous rage about not being able to quote a review about his own book, because of DRM. One of my interests is to understand how we each construct our reality and how we might change that reality and how we might avoid having it manipulated against our best interests. For that matter, if I had to choose only one field of interest for myself, that would be it. We make over-simplified conclusions about what reality we're living in, based on our incomplete perceptions and based on our abstract reasoning derived from what we previously have perceived and concluded. The neural pathways of our brains and the unspoken assumptions and fixed structures in our minds form filters that we experience the world through. Filters that make us experience only a very, very small portion of what is actually happening, and to interpret even that portion in a sketchy and generalized manner. Smart people who understand this well can provide us with manufactured scenarios that guide our perceptions into making certain conclusions about reality (which they'd like us to believe) and into avoiding certain other conclusions (which they'd like us not to know about). Most people are so busy living IN the reality they believe they exist in so that they very rarely are able to even consider that it could be any different. So, I don't meet very many people I can talk to about these things, other than in a fairly general metaphysical context. And I'm interested in the more technical angle on it, of how we do it, and how we change it. Right now I'm looking at organelle.org. Looks promising, like somebody delving deeply into these things.